It was heartening to read in International Squash magazine Jonah Barrington's enthusiastic endorsement of what he sees as a new "British circuit" emerging (extracts of which are reprinted here). 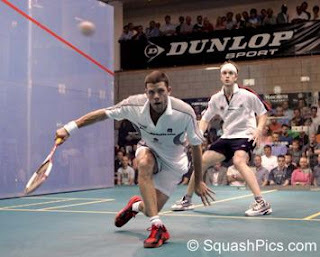 His comments related to the busy autumn and winter schedule of squash events currently being promoted in the UK. Britain's most successful squash player also commented on the history of the British Open, and how he felt that, with the kind of backing that it is currently being promised, should soon again regain its proud status as the "Wimbledon of squash" - the most prestigious tournament on the tour. However, around the time I was reading Barrington's comments, the news also broke that Ramy Ashour - currently the hottest ticket in world squash - had decided not to play in next months' British Open in Manchester. How does Ashour's non-appearance sit with Barrington's vision of the event's status? Why the "Wimbledon of squash"? 1. The phrase is bandied around in relation to more than one thing. I have read it used to describe the British Open in order to emphasise its history and prestigiousness. I've also seen it used to describe (hitherto) squash's most important venue in the UK, the now sadly closed Lambs club in London. This multiple use is confusing, and lessens the phrase each time it is (mis?)applied. 2. The Wimbledon Tennis Championships have been around for a long time - since 1877, in fact. Squash's British Open has been in existence since 1922 (for women - interestingly, for sport, the women's tournament has been around for longer than the men's) and 1930 (for men). However the difference is more significant than in the time the respective events have existed. The great tennis tournament has been held at its landmark venue for the majority of those years, with all the history, drama and memories bound up with the players' and spectators' knowledge of what the "Wimbldeon experience" is - from queuing in the rain to strawberries and cream to "Henman Hill". The tournament is even named after a place (unlike the other tennis Grand Slams), and it is this sense of a sporting venue being special for two weeks of the year that makes for such a great experience. The British Open doesn't have this enigmatic claim, as it has moved over the years from city to city, venue to venue. The sense of occassion is simply not the same when a tournament is not rooted in the traditions of place. 3. Wimbledon is a tennis tournament, and squash maybe does itself a disservice by defining itself through its relation to another sport. 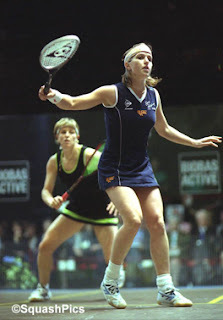 My argument is not that the British Open has not been (to date) the most important event in world squash. The records books show that it has. It is that the term "the Wimbledon of squash" is a misnomer. Barrington's enthusiasm for the event and his hopes for it to regain its previous hights will be shared by many squash fans (and players), but the degree to which it is possible is open to question, given the sport's decline over the past couple of decades. Given the fact that the event has struggled over the past few years to attract a lead sponsor, one could argue that the British Open has long ago lost any claim it had to be the revered crown in the professional game. The World Open far out-muscles it in terms of prize money (this year the British Open musters $78,000 for the men's draw, compared to the World Open's $175,000), and it is clear that with the investment in the World title, together with hefty Middle East sponsorship from the likes of Ziad Al-Turki, has meant that the top players are beginning to look elsewhere for ranking points and a sizeable pay day. 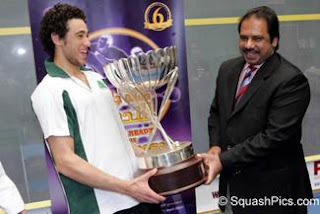 Which brings me to Ashour's decision not to play in this year's competition at the National Squash Centre in Manchester. The tournament's failure to attract this year's top player (Ashour may not yet be the world number one, but it only seems like a matter of time) has received surprisingly little coverage in the squash media, maybe because the young Egyptian's decision may not have been entirely his own: "My manager recommended I didn’t play. It is not good for points. I need to concentrate on other events and watch the points." I don't think that the British Open needs to boast the highest prize money of any event on the PSA or WISPA tours to retain a sense of its prestige. But it does require a level of sponsorship somewhere in the region of the big events in Qatar, Kuwait or Saudi Arabia in order for promoters to attract the top players. What seems certain is that without comparable prize money and the ranking points that come with it, more players are likely to withdraw to keep fresh for more lucrative tournaments. History, it seems, may no longer be as important as it was. But while history (and wanting to be part of an event that has a grand history) will always be important to some, so is change. Perhaps those of use who are well aware of the British Open's past should spend less time trading the tournament on its former glories and take a braver step into the future. Paul Waters' internationalSPORTgroup clearly have the enthusiasm and a sense of vision that hopefully will tranlsate into the resurgence of the event that Barrington and many of those who love squash crave. 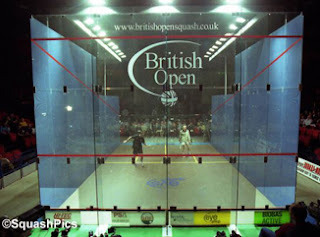 The British Open is important to squash as, to an extent, it is its history. The solution for how this braver step can be taken should thefore a question for the whole squash world, rather than the beliguered promoters who struggle from year to year to prevent the door closing on the Open's history for good.